Hi all! Getting on with the rigging. I have another question. It´s about the big rope supporting the mainmast, that goes around the bowsprit. This is on the real ship (and on Claytons model). The 1:10 does not have this, but I think it just goes around the foremast. Looking at the real ship, this looks "wrong" as it doesnt fit the stair step as can be seen on this picture. Is some part missing? And why the difference between the real ship and the 1:10? I realise that this may have been answered before and I may have missunderstod it due to my limited knowlege in rigging terms. This question comes up all the time, since the ship itself provides conflicting evidence. First, the model. The 1:10 model was conceived and built during the 1980s, in order to be ready for the new museum when it opened in 1990. As such, it represents the modelmaker's understanding of the ship based on the knowledge available 30 years ago, before the ship had been completely recorded in detail and before it had been rerigged. It contains a number of features which we now know to be errors. For example, the deadeyes were painted red on the model because of traces of red coating on a couple of the deadeyes found in the ship. This red coating turned out to be a corrosion product from nearby objects rather than paint. The crossbars on the fore and main topsail sheet bitts have belaying pins in them, even though there is no trace of these in the ship itself. This is one of the features that crept into the model through the belief, at the time, that the ship was not finished when it sailed, and thus the modeller was free to add things that he thought should be there (we still encounter that idea on this forum occasionally). The model shows all the guns run out, except the last broadside ports on the lower gundeck, which are closed. This is very strange, since those two ports are the only two that we can conclusively prove had guns in them, since they were still at their gunports when the ship was relocated in 1956, and one of them was still on its carriage, poking out of the port. Much of the rigging tackle does not agree with the finds - the martnets on the courses use the wrong size and shape of euphroe, leading to two few legs in the crowsfeet, for example. The model represents what we thought about the ship 30 years ago, before the ship itself had been rerigged, combined with independent decisions made by the modelmaker for aesthetic and other reasons. It was updated a couple of years ago, but that project only addressed the colors, none of the structure. In short, it is not always a reliable source about all aspects of the ship. Now, the mainstay collar. The mainstay is set up on a pair of big, rectangular deadeyes abaft the foremast (which seems to be typical of 17th-century practice, based on models and images). The collar goes around the mast and then is secured forward. It is normally secured to the bowsprit, although it is also possible to fasten it directly to the foremast. In some ships, the collar passed over the forward edge of the upper deck or forecastle head and then down to the bowsprit outboard of the stem in the beakhead, which is how it appears on the Hohenzollern model of c. 1660 and how we have the ship rigged. An alternative was to pass the collar through the deck and then to the bowsprit inboard of the stem. In this case, there need to be a pair of angled holes in the deck planking. Strangely enough, Vasa has these holes, with little fairings in front of them, indicating that they are intended for a line to come from above and aft, just as the collar does. These are different from the "cardinal's hat" fittings seen in the same location on the Gent model being discussed in another thread (those fittings are for lines coming straight down). These holes would seem to suggest that on Vasa, the collar passed through the deck, as we have the 1:10 model rigged, but there is a problem. There is nowhere below the deck to attach the collar. 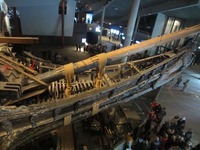 Only the upper surface of the bowsprit is visible, and the deck planking is fitted tightly around it - there is no way for the collar to go around the bowsprit, and no fastener holes that indicate any other form of attachment. Our conclusion is that the carpenters made the holes with the intention to rig the stay collar through the holes, but then did not follow through. We have plenty of other details that show similar changes during the building and rigging process. For example, the mastheads are outfitted with Dutch-style caps, which are rounded to allow the halliard ties to pass over them, but in fact the ties go through sheaves in the sides of the mast below the trestletrees. If the collar does not go through the holes, the only other option that works physically is to take it over the edge of the deck and down into the beakhead. On the Hohenzollern model, this is done by running the collar under the big beam over the foredeck (see Tafel 9 in Winter's book), but this results in a seriously unfair lead with a double kink on Vasa. Instead, we have lead it over the foredeck beam, which puts a milder, single kink in it. Not ideal, but workable, and there is a good place to lead the collar under the bowsprit, just before the stem. This arrangement has the disadvantage that it makes the center set of stairs on the beakhead bulkhead unusable, but there are plenty of other stairs. This also suggests that this arrangement was not the original intention. Why it did not work out with the foredeck holes, I have no idea, but leading the collar through the holes would make the fore topsail sheet bitts very difficult to use, as the collar would lie nearly on the crossbar. Thanks for the in depht answer! I will try to base mine on the real ship then. My plan now is to make the first level of the masts with shrouds and ratlines. That will give time for the new Vasa book to be released. Hopefully the shrouds and collar construction are not something that is changed in the upcoming book. Actually, there may be a big change in the shrouds - I will post here when I have details - but I can keep you updated so that your model is right! NOOOO, and I thought I played it safe hahaha... Oh darn! Not in trouble, the adaptation will be a simple one. Phew, thanks Fred! And for the heads up. Fred, I've started doing the ratlines now. Do you know anything I should avoid? My plan is to do the ratlines then pretty much pause the rigging until Vasa II is out. Only weird thing about the ratlines is that the ends are clovehitched around the shrouds, rather than seized through a spliced eye, as was later practice. Thanks, yeah I don't know how to imitate that at this scale, and at the same time keep controle of their shape. Did I understand correctly that there will only be a simple adaption in Vasa II and I can keep on doing the ratline setup as they are on the real ship on the museum? Ratlines will not change, the main issue is that we think that there is one less shroud and that the deadeye is for a running backstay to the topmast. Ok, thanks for the heads up Fred! Hi all! I'm wondering about how the masts work: When they put the higher masts in place (or lower them during storms like in the Landström picture below) where did they put the ropes to be able to lift it and then hold the mast in place? Does anyone have pictures of this? Was it a common practice to have them like in the picture? Landström calls it "strukna stänger". 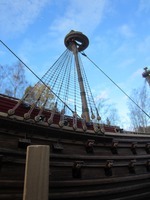 The deadend was attached to an eyebolt or ringbolt on the underside of the lower mast cap to one side of the mast (the port side, in Vasa's case). From there, it was rove through a sheave set in the lower end of the topmast and then back up to the other side of the mast cap, where a block was stropped to an eyebolt. From the block, the line led down to the deck through the lubber's hole on that side. It could be rigged with a tackle at its lower end, but Vasa used a simpler solution. The fall of the toprope led through a leading sheave in the halliard bitt/knight and then aft to the capstan, which was used to haul the toprope. On the foremast, the sheave was the larger outboard sheave in the halliard knight on deck and it led the line to the jeer capstan on the upper deck. For the main, the line led down through a hatch in the upper deck, then a hole through the upper gundeck just in front of the main halliard bitt, then to a sheave in the lower end of the bitt, so that it could be taken aft to the main capstan on the lower gundeck. In practice, the toprope was used to raise the topmast just above its fixed height, so that a fid (rectangular wooden pin) could be inserted through the heel of the mast. This stuck out of both sides of the mast, so that when the toprope was eased, the fid rested on the trestletrees and carried the weight of the mast. In the process of striking or setting the topmast, it was necessary to prepare by loosening or slackening all of the lines which would be affected, such as the gear for the topsail and some of the course gear. The course yard parrel had to be slackened so that the yard could be hauled ahead to make room for the lowered topmast. After the mast was lowered, it needed to be secured, as did all of the now loose gear above the top. When set, it may be necessary to retension the shrouds. 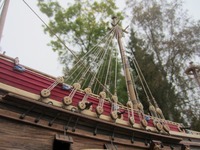 On the modern sailing reconstruction Kalmar Nyckel, we regularly strike and set topmasts to get under low bridges, and the process takes 4-5 hours for all three topmasts with a crew of 12-20 people. We can do it under way or sitting at a pier, and we once struck topmasts in a hurry as the first stage of preparation for being run over by hurricane Irene. We did this while racing up Delaware Bay to our storm moorings in Wilmington. Below is an illustration of the toprope lead at the masthead on Vasa. Great, thank you for your explanation and picture Fred!